Kateri Tekakwitha — Noble Turtle, Mother Earth gathers her people. Tekakwitha. 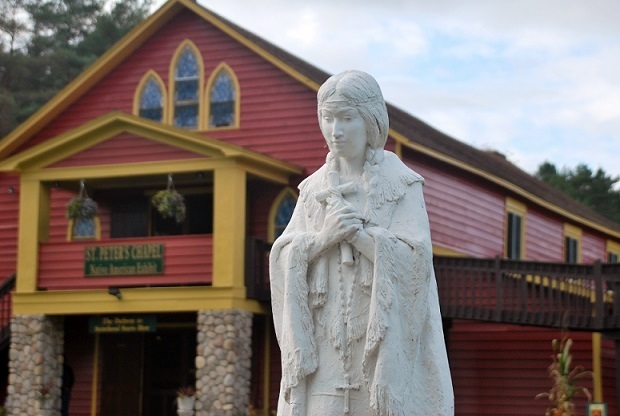 Known as the "Lily of the Mohawks" Kateri was born in Caughnawaga in what is now upstate New York in 1656. She was baptized in 1676 and died at the age of 24 in Canada. Kateri was declared venerable by the Catholic Church in 1943, Beatified in 1980 and finally, Canonized in 2012. Saint Kateri is the patroness of the environment and ecology as is St. Francis of Assisi — the namesake of the current pope. In Her Footsteps was spoken at the National Saint Kateri Tekakwitha Shrine in a celebration mass recognizing the first anniversary of her canonization October 12-13, 2013.